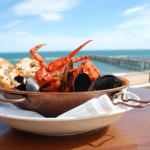 Overlooking the beautiful Henley Beach, SeaSalt is iconic for serving up delicious locally sourced seafood. Designed by Studio Gram, the team behind Osteria Oggi and Shobosho, SeaSalts retro décor creates the perfect atmosphere to sip on local wine and take in the view. With so many exceptional west-facing beaches so close to the city centre, Adelaide’s sand and surf are virtually inescapable. Pull-up a stool at Melt for the best seat in the house. Perched above SeaSalt, Melt’s décor is bright and airy with a retro pastel palette. The pizza menu is as extensive as it is impressive, offering gourmet toppings from Spanish meatballs to scallop and truffle. 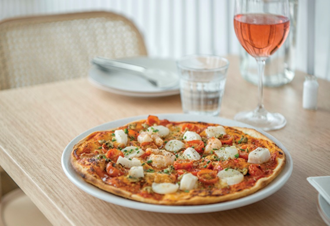 After dining on gourmet pizza downstairs at Melt, head up to West Bar and grab one of their many cocktails or glass of South Australian wine and head out to the terrace. 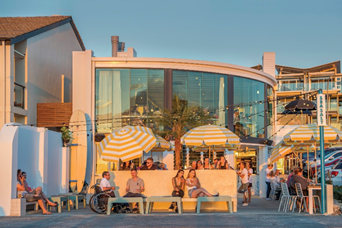 The bar opens up to specular views of Henley Beach making it the perfect place to spend the afternoon as the sun sets. Sitting on the shore of Port Noarlunga, Hortas restaurant and Café is a favourite among locals for its Portuguese and Mediterranean-inspired dishes. With uninterrupted ocean views the balcony is the perfect spot to settle in with a glass of McLaren Vale and watch a famous South Australian sunset. The Moseley Beach Club returns in 2018, luring crowds to the pristine white sand and lapping waves of Adelaide’s favourite city beach. Grab a cocktail and settle-in for the day on premium sun beds or fully-serviced lounges. Casual dining is available as well as a bar, with live music and DJs providing the perfect summer soundtrack. instead focussing all its efforts on plating-up unsurpassable food and wine in naturally stunning surrounds. In addition to the above, the South Australian Tourism Commission also has a list of the top 5 best beaches in Adelaide which could complement the waterfront bars and restaurants content.